1. Gadgets galore. Apart from tons of new gadgetry to be launched during the event, special deals and discounts will be offered, too. So if you feel like going gadget shopping, or you need to upgrade your gadget stash, CEL is it for you. 2. Cosplay! Cosplay.ph has organized a—what else?—cosplay contest on November 14, Saturday. All you Alodia fans and wannabes, here’s your chance to get dressed, get noticed, and get close to all your cosplay crushes! 3. Money-making strategies. For the more entrepreneurial gadgeteers, there are two blogging forums that aim to teach you the basics of blogging and how to make money off it. The first is a blogging forum that happens on Saturday November 14. It has successful bloggers Carlos Celdran, Abe Olandres and Blogie Robillo revealing their blogging secrets. The second blogging event, called Mini iBlog Summit, happens on Sunday, November 15. It will have the likes of Anton Diaz of Our Awesome Planet sharing their blogging secrets and strategies. 4. Pacman! There will be a live screening of the Pacquiao-Cotto fight on Sunday, November 15. 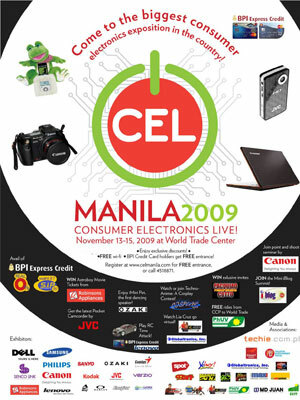 Register at www.celmanila.com to get a chance to win tickets. Attendees of the first two days of the summit (November 13 and 14) have a change to win, too. An awesome side tip: if you’re an FHM subscriber—and we do hope that you are—you get a free one-day pass at CEL. So yeah! We’ll see you there!